Hello my friends! It’s official now: we’ve fallen out of summer and today marks the beginning of the fall season. I know I’ve been writing about fall for a while, but today is the most important day of the series because it’s the actual start of autumn. First of all I want to thank you for your reception on the fall series. You guys have been responding really well here on the blog and on social media, so I’m super glad you liked this idea and of course, you can expect more cool content coming really soon. As I said, I’m being profiled for the Fibonacci Sequins fashion-tech blog very soon, and I can’t wait to show you the amazing photos we took the other day and my story behind fashion, blogging, going into tech, and more. So keep posted to that because I’ll annnounce it here very soon. The other day, I met with Kim for our regular meet ups over coffee and fabulous fashion shoots. It all started out pretty well, because since I hadn’t seen Kim since my return from my trip to Mexico, I had many things I wanted to talk about with her, and I wanted to give her the gift I brought her from my hometown. I was super excited when I saw her face when I gave her a colorful poncho-scarf that I think is really her style, and she was overpleased with joy. I’m so glad you liked the gift, boo! Then, we did our fashion shoot, where she wore the scarf that I brought her, and she looked amazeballs in it! We’ll be able to see those pics very soon on her blog :). We also did this photoshoot which I’ll explain in a little bit. As if our day couldn’t be any better, we stumbled upon Dona at the Commons! That really was the cherry on top of the cake of an incredible day together, since we all talked about fashion for a while, and I mean, we all looked fabulous AF, so everyone was just walking by and staring at this trio of fashionistas; it was pure awesomeness. Thanks again for living and sharing these experiences with me Kim! Really my day just gets brighter when I see you! Now back to the post, as part of the fall series I present another piece that’s really in during this season (I saw a bunch of these at a first-look event in J. Crew last week): the cardigan. 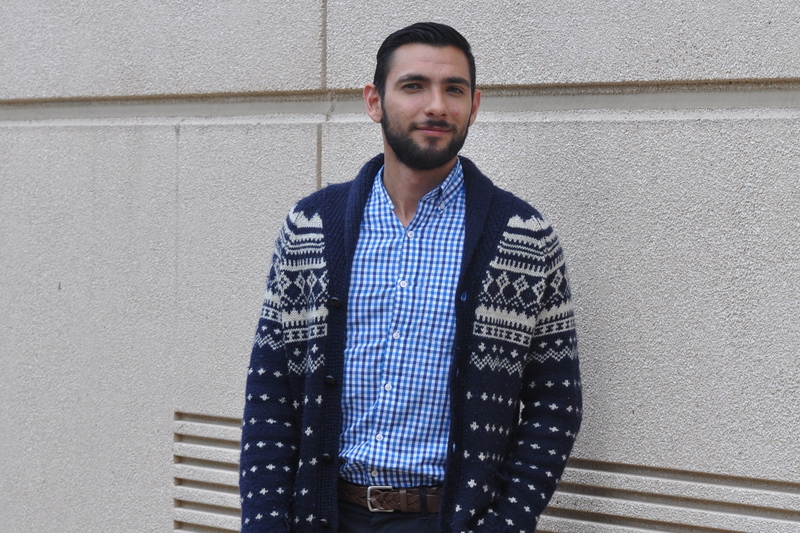 Cardigans are a great way to completely change an outfit by just throwing something else completely different on top of a really normal outfit. 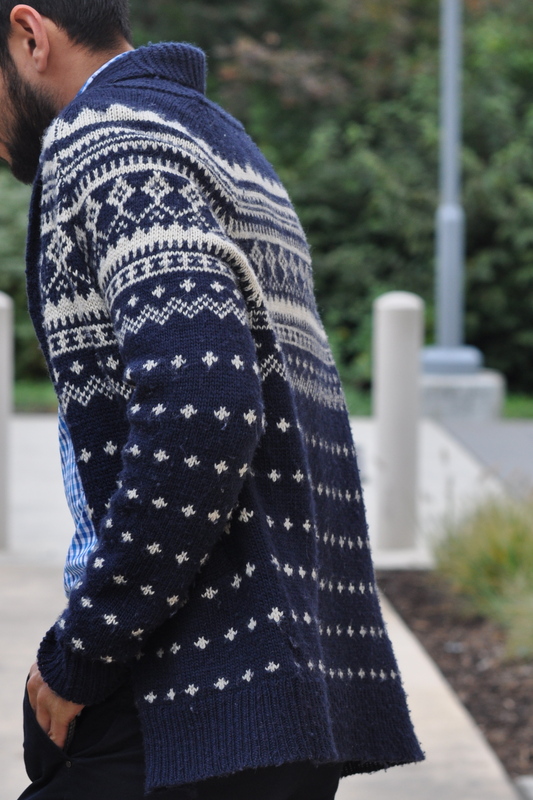 In this case, I decided to wear this cardigan from J. 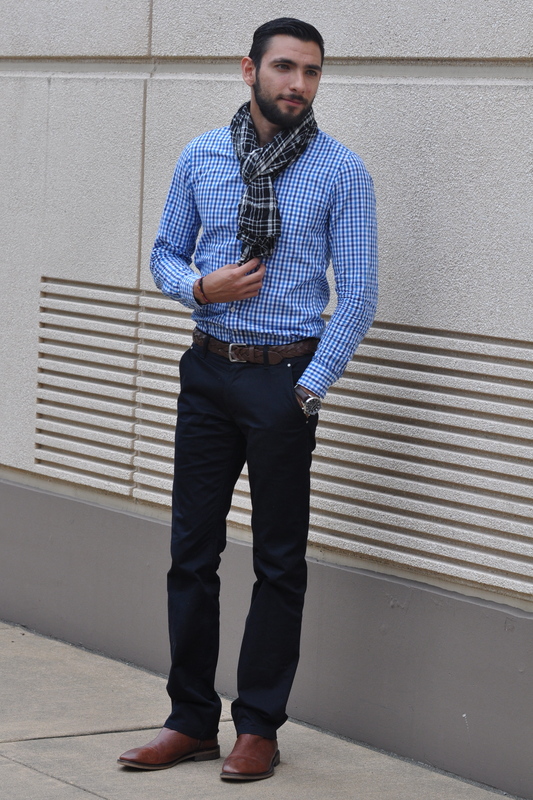 Crew with a plaid button-down, also from J. Crew, and a blue navy pant from Zara. 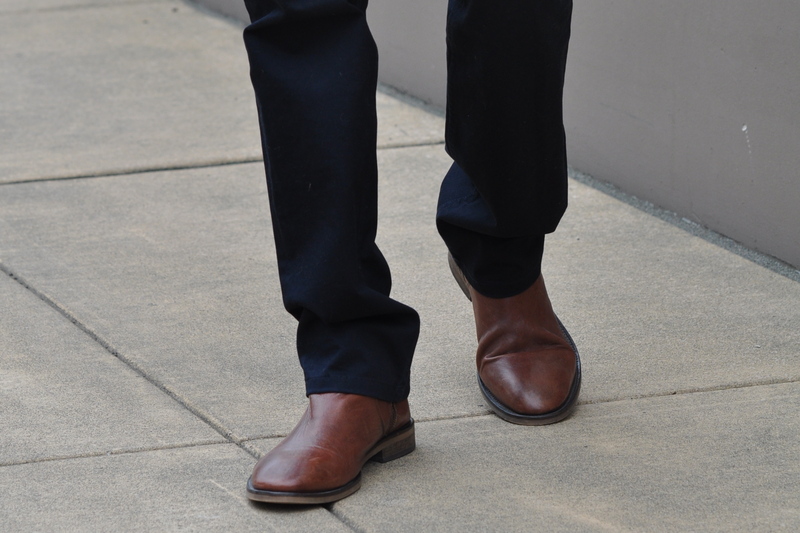 Look how cool and sophisticated these portray, especially if you pair them with a nice set of Chelsea boots. 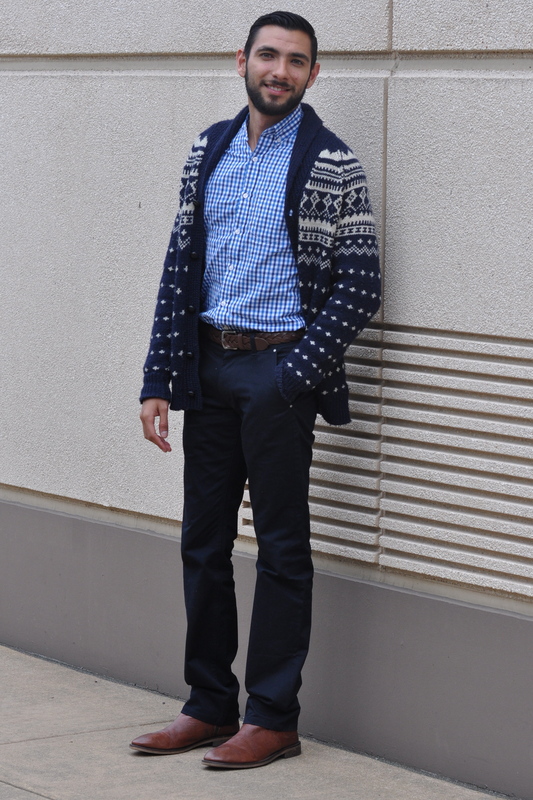 This is way more formal than what I usually wear, but I still loved the combination of colors and prints. Now, notice how different this outfit shines when I put the plaid scarf on top. 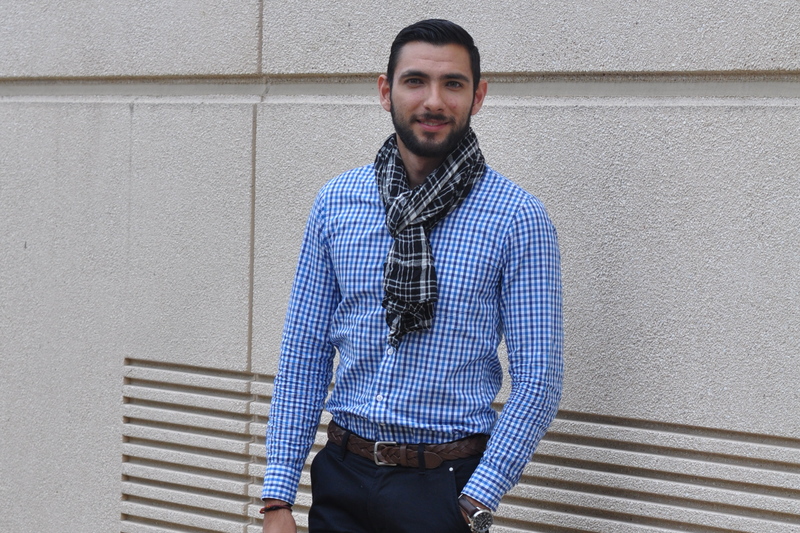 The light scarf is a great accessory to give a more relaxed, laid-back touch to any outfit, and see how different it feels from the cardigan look. 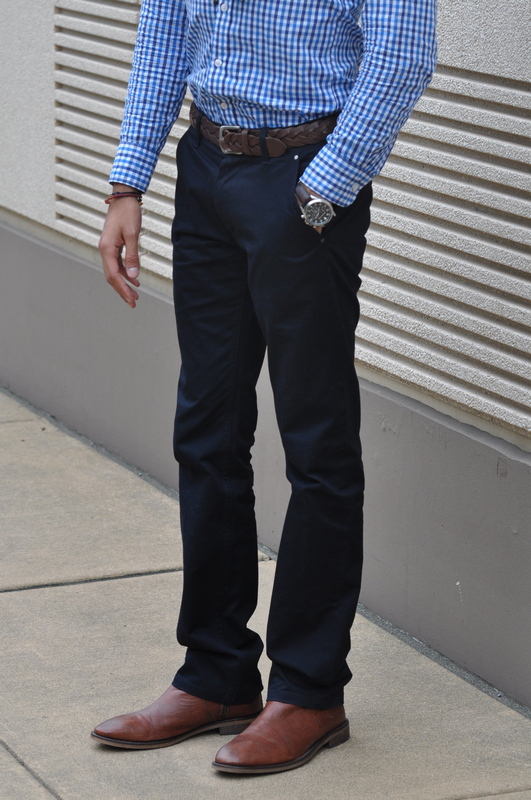 Finally the belt that I chose to wear, a braided, brown belt, just ties everything up very harmoniously. What do you think? 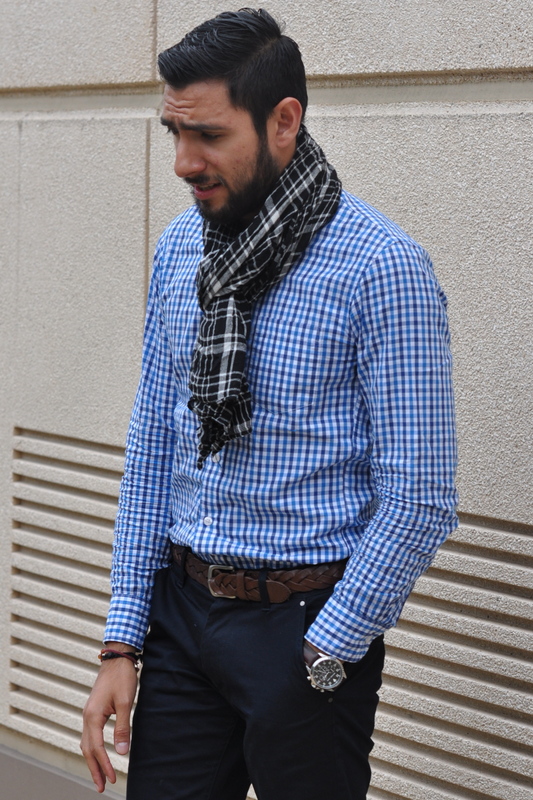 Do you like how the ensemble radically changed just by choosing the scarf over the cardigan? Thanks again to my friend Kim for the pics, I love them and I love you! I hope you guys liked this post today and that you’re excited about the conclusion to the fall series next week on Geek Q. I want to thank each and everyone of you for your amazing support, I could never do this without you. Being in the last stretch of the year, I’m looking forward to the amazing things coming to the blog in the near future, and I just can say you can’t miss this so please keep posted. Like everytime, remember to be stylish and to let your voice be heard through the way you dress and how you portray yourself. And remember to do this with a lot of confidence, which is the best thing you can wear (along with a smile of course :)). Thank you for reading today and I’ll see you very soon. Till next week! ¡Hola amigos! Ya es oficial: hemos pasado al verano y el día de hoy marca el inicio de la temporada de otoño. Sé que he estado escribiendo acerca del otoño por un rato ya, pero hoy es el día más importante de toda la serie porque es el día exacto de la llegada del otoño. Antes que nada, quisiera agradecerle a todos ustedes por la increíble respuesta que han tenido con respecto a la serie de otoño. Me han correspondido muy bien tanto aquí en el blog como en las redes sociales, y estoy muy feliz de que les haya agradado la idea, y por supuesto, pueden esperar más contenido de ese estilo muy pronto. Como les había platicado, voy a aparecer en el blog de moda y tecnología Fibonacci Sequins próximamente, y no puedo esperar por mostrarles las increíbles fotos que tomamos el otro día así como hi historia detrás de la moda, el blogging, el haber elegido mi carrera en tecnología, entre muchas cosas más. Así que manténganse al pendiente porque se los voy a anunciar por aquí muy pronto. El otro día, organicé con Kim nuestra ya regular reunión para tomar café y tomar fotos para nuestros blogs. Todo empezó muy bien, ya que como no había podido ver a Kim desde mi regreso a México, tenía mucho que contarle. Además, quería entregarle el regalo que le traje de mi ciudad natal. Me emocioné mucho al ver su reacción llena de júbilo al entregarle una mascada en forma de poncho con muchísimos colores, la cual creo que le queda como anillo al dedo a su estilo. ¡Me alegra mucho que te haya gustado tu regalo, amiga! Luego, cuando tomamos las fotos para el blog, se puso la mascada que le traje y, ¡se veía increíble en ella! Vamos a ver esas fotografías muy pronto en su blog :). También hicimos este photoshoot, del cual hablaré un poco más adelante. Nuestro día parecía no poder estar mejor, sin embargo lo hizo, cuando nos topamos a Dona en The Commons. Eso fue realmente la cereza en el pastel después de pasar un día inolvidable juntos, ya que hablamos los tres sobre moda por un rato, y mientras platicábamos la gente que nos veía pasar sólo se nos quedaba viendo porque nos veíamos muy a la moda; estuvo increíble. Muchas gracias Kim por vivir y compartir estas experiencias conmigo. En verdad mi día se ilumina con tan solo verte. Ahora regresando a mi post de moda, como parte de la serie otoñal les presento una pieza más que esta muy in esta temporada (vi varios de estos en un evento de inicio de temporada en J. Crew la semana pasada): el cardigan. 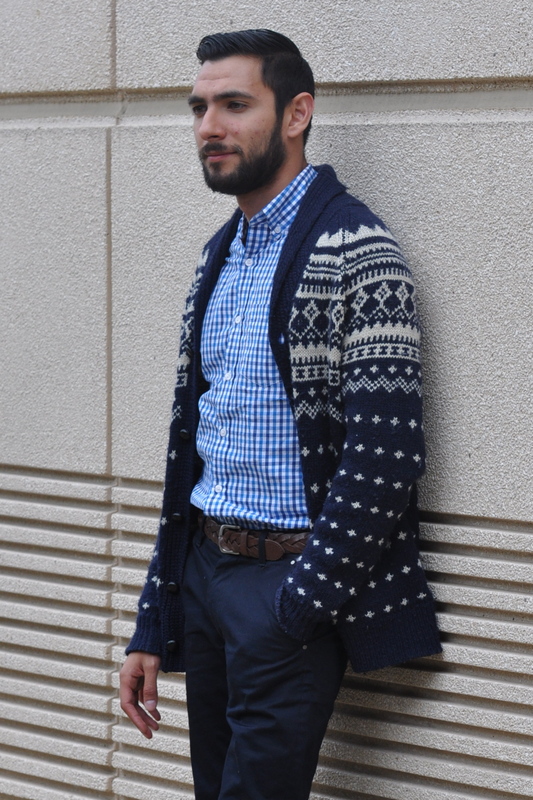 Los cardigans son una manera muy original de cambiar por completo el look de un outfit con tan sólo agregar algo encima de lo que ya estás vistiendo en cualquier día normal. 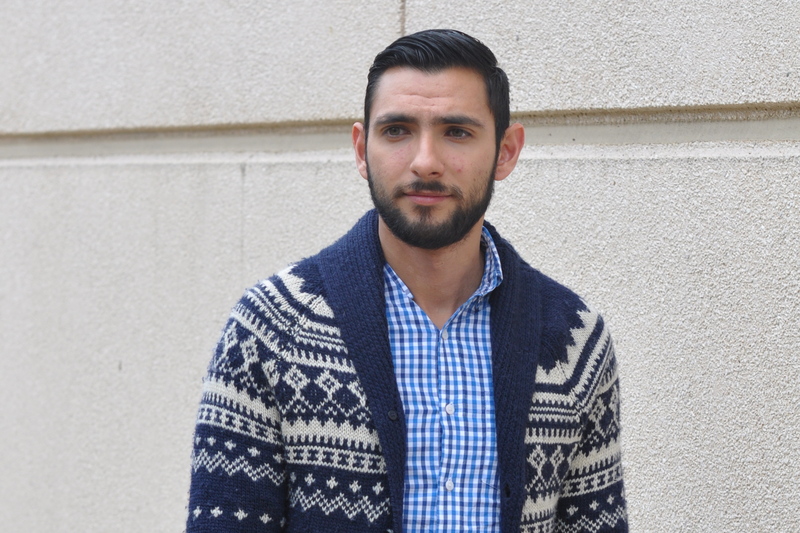 En este caso, decidí ponerme este cardigan de J. Crew con una camisa de cuadritos, también de J. Crew, y un pantalón azul marino de Zara. Vean que fresco y sofisticado se ve este look, especialmente si lo combinas con un par de botas estilo Chelsea. Esto se ve mucho más formal de lo que suelo vestir, pero aún así me encantó la combinación de colores y patrones. Ahora bien, noten lo diferente que esto se ve cuando me pongo la mascada en vez del cardigan. 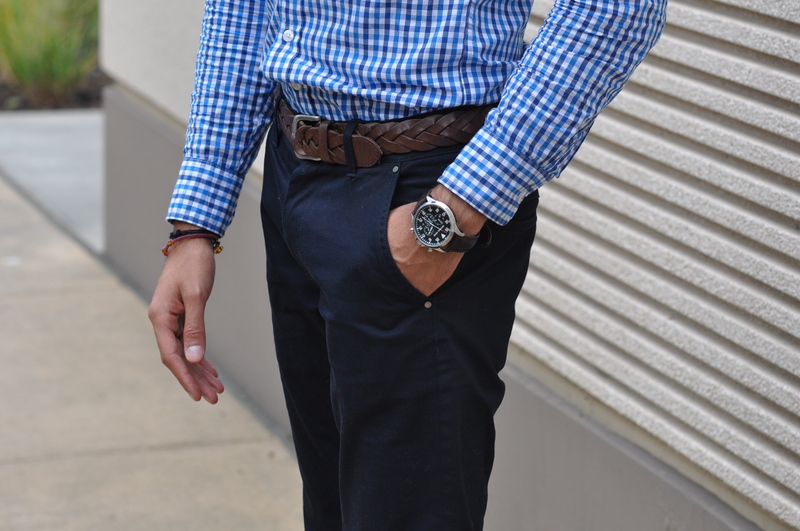 La mascada es un gran accesorio para darle un toque un poco más relajado y casual a cualquier outfit, y vean que diferente se siente en comparación con el otro look. Finalmente, el cinto que decidí usar, un cinto café trenzado, sólo ayuda a unir todo bajo una misma armonía. ¿Qué opinan? 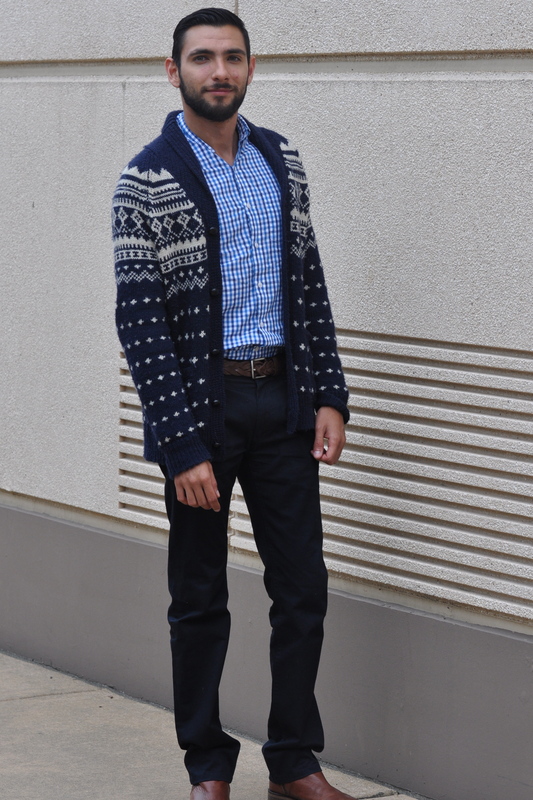 ¿Les gusta como el conjunto cambió radicalmente sólo con elegir la mascada sobre el cardigan? Muchas gracias nuevamente a mi amiga Kim por las fotografías, ¡me encantaron y te quiero mucho! Espero que les haya gustado mucho el post del día de hoy y que estén tan emocionados como yo por la culminación de la serie de otoño la próxima semana en Geek Q. Quisiera agradecerle a todos y cada uno de ustedes por su incondicional apoyo en este proyecto, nada sería posible de no ser por ustedes. Estando ya en la última parte del año, veo con buenos ojos a lo que está por venir en el blog en el futuro próximo, y sólo les puedo decir que no se pueden perder todo lo que tengo preparado para ustedes, así que manténganse al pendiente. Como siempre, les recuerdo que se vistan a la moda y que dejen que los demás escuchen su voz por la forma en la que visten y en la que se presentan a los demás. Recuerden hacer esto con mucha confianza, ya que nada se porta mejor que esta (junto con una sonrisa por supuesto :)). Muchas gracias por leer hoy y nos vemos muy pronto. ¡Hasta la próxima semana!